8) Local- There’s something to be said about the local culture of Raleigh. It lends itself to the close knit sense of community that we have. There are many, many creative small businesses who all support one another, the community and the creative energy of the area. Local shops like Michelle Smith’s Gather, a gift and coworking space, embrace this concept of “local” by supporting local artists by offering them a place to work, a place to sell their work and a place to relax and with other creatives. The Raleigh area is small enough that you don’t get completely lost in the shuffle, but big enough that you’re surrounded by creativity and inspiration everywhere you turn around. The sense of community extends beyond just designers and intertwines with the paths of many other creatives, businesses, organizations and individuals. 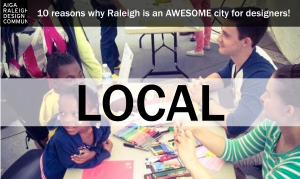 Ahhhh, Raleigh- a great local place to work as a designer!